Club football returns to ESPN now that the international break is over, with Toronto FC vs New York City FC, Columbus Crew SC vs Atlanta United FC, and Man City vs Brighton leading the way. With the international break coming to an end, coverage of domestic league football will resume on ESPN. Major League Soccer will take center stage between Friday, March 29 and Sunday, April 7 with a number of bangers in-line for their viewers. Live Soccer TV provides info to catch all the fixtures taking place on matchday two in MLS, including NYCFC vs DC United. Four MLS teams will try to end the dominance of Liga MX clubs in this competition, who have won the title in the last thirteen editons. Once again, Major League Soccer and Liga MX clubs will battle to win the supremacy of the CONCACAF region in the Champions League. But this time, MLS sides hold an edge over their Mexican counterparts. The 2019 MLS season will be soon underway, with new expansion club FC Cincinnati eager to join the mix and Atlanta United seeking to defend their MLS Cup. ESPN will be carrying over 30 of the games during the regular season, and here's all you need to know to follow your favorite team starting from this March. 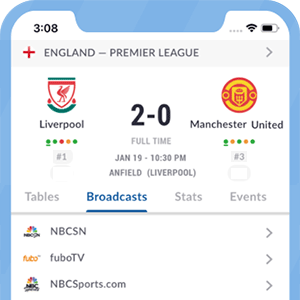 Live Soccer TV provides info to catch all the fixtures taking place on matchday one in MLS, including LA Galaxy vs Chicago Fire. Who will clinch the 2018 Cup? Tune in to Atlanta United vs Portland Timbers on FOX in the USA starting from 20:00 EST (17:00 PST). Juventus vs Inter Milan, Chelsea vs Man City, River Plate vs Boca Juniors, and Atlanta United vs Portland Timbers are just a few of the must-watch games from Friday to Sunday. Fox Sports 1 will show the second leg of the Eastern Conference Championship between New York Red Bulls and Atlanta United at 19:00 EST. Who'll book their spot in the finals? Catch Atlanta United vs New York FC on ESPN as the two sides battle fora coveted berth. Dortmund vs Bayern Munich, Boca Juniors vs River Plate, Man City vs Man United, and Monaco vs PSG are a few of this weekend's must-watch games. Der Klassiker will kick off at 12:30 ET/17:30 GMT on Fox Sports in the USA; BT Sport in the UK; Sportsnet in Canada; beIN Sports in Australia; and Sky Sport in Germany. Catch New York City FC vs Atlanta United at 19:30 EST on Fox Sports 1. LiveSoccerTV's match preview provides team news and match facts for the first leg of the MLS Cup semi's clash between Atlanta United and NYC FC on November 4th. Atlanta United and Houston Dynamo will try to make their home-field advantage help them into reaching the semi-finals of the competition. The Major League Soccer enters its play-off stage, and added to yesterday's wins by New York Red Bulls and Vancouver, a couple of breath-taking clashes are set to take place today. After sendind the ball into the back of the net, Jozy Altidore had to deal with a disgusted fan's actions. Giovinco's reaction was simply epic. A disrespectful act by an enraged fan was turned into an epic response by one of the league's best players. Clint Dempsey revealed his inner Ronaldinho in Seattle Sounders goalless draw with Atlanta United. Despite their goalless draw with newly-promoted outfit Atlanta United at the Century Link Field on Friday March 31, Seattle Sounders played quite an entertaining game. And Clint Dempsey was the senior entertainer of the evening. MLS reveal official match ball for 2017 season...and it is stunning! The 2017 MLS match ball is more than just beauty - it is a perfect work of art. The team will make its debut in the 2017 MLS season. Martino recently stepped down as Argentina's manager after undergoing a six-month spell without payment. After turning down job offers from his home country and Mexican clubs, coach Gerardo Martino was finally unveiled as Atlanta United's first-ever manager for the 2017 MLS season.